Now this is a hot topic in the parenting world. Most parents who do not have picky eaters will adamantly cry out that picky eaters are made, while those with picky eaters will usually declare picky eaters are just born. So where is my stance? My stance is complicated, but I have to say if I were forced to pick just one side, I would lean to “made.” My reason for this is that no matter where the child’s natural disposition is, parents have a huge impact through their nurturing. Now, some children are born good eaters and some children are born picky eaters. Picky eaters often have a reason for being picky. Kaitlyn (now 6) was born picky. Her reason is reflux. Certain foods caused pain. Some children might be picky because of allergies. Some might have texture or temperature issues. On Becoming Pre-Toddlerwise states “Excluding a medical condition, picky eaters are created, not born” (page 61). Some children are born with picky tenancies for good reason. Today I would still consider Kaitlyn picky. I am not sure if everyone would consider her picky, but she is picky compared to my other kids. We have worked to get her to not be picky, and she has made long strides, but she much prefers a bland diet. Another thing about Kaitlyn is that she doesn’t eat a large quantity of food. My other three children eat a TON of food, but she eats very little. I don’t concern myself with the amount of food she eats; she is intelligent and isn’t going to let herself starve. I do, however, need to be sure I don’t put a huge portion of each food on her plate. There needs to be enough so that she has room for all of the foods I want her to eat. You can always add more of a favorite food after certain foods are eaten. Some children, however, are born picky with no medical reason. My Brinley (now 9 months) falls in this category. She did not like vegetables at all when I first started feeding them to her. She would eat fruits with no problem, but no to the vegetables. She would gag them back out. My mom wouldn’t even feed them to her because she didn’t want to be “mean” (she is the grandma–she has that prerogative). Today, however, Brinley loves her vegetables and eats them right up. This didn’t just happen–I took what she was born with and nurtured her in a direction to be a vegetable eater. I also have two who were born good eaters. Brayden (now 7–coming up on 8) and McKenna (now 4) have always been really good eaters who will pretty much eat anything and everything. They are adventurous and enjoy trying new foods (though that doesn’t mean they enjoy everything they try). Now there have been things both of them have tried that they didn’t like that I have had to keep giving. It hasn’t all been a “feed and they love forever” situation. 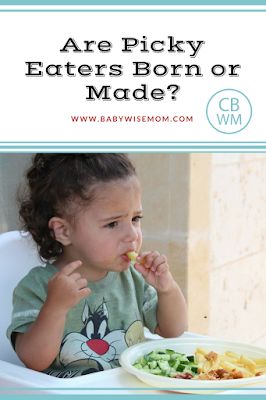 I know the difference between a child who was born a good eater and a child who was made a good eater. I know that a parent who has a naturally born eater can’t appreciate the effort that goes into creating a good eater from a naturally picky eater. I know that for a parent with a picky eater, food can become such an issue. There are may things I did to “nurture” Kaitlyn’s natural pickiness. I did not always require her to eat foods that she did not like because I didn’t know if they caused her pain or not. I know that helped grow a pickiness that was already naturally there. Could I do it differently today? I am not so sure. Medical pickiness is difficult. I definitely wouldn’t force a food that caused pain on a child, and it is hard to know the difference when a child can’t talk. I might be better at discerning now if faced with a child just like Kaitlyn since I have had both Kaitlyn and Brinley, but I am sure I would err on the side of caution and not force too much. As Kaitlyn has gotten older and the reflux has gone away, we have required more adventurous eating. There are still things I don’t push, like anything citrus or anything tomato based. Those things still give her heart burn.I have things I don’t like and I allow my children to have things they don’t like, also. When we have a green salad, she can take the tomatoes out of hers. But she still needs to eat the rest of the salad. She needs to try new foods when we have them (again, barring the citrus and tomato items). She needs to have a balanced meal and eat a variety of vegetables and fruits. If you have a picky eater who is not picky for medical reasons (like Brinley), try these steps. Don’t stress out. I promise your child will not starve herself. If you stay consistent, she will get to the point of eating a variety. You might have to periodically encourage her to try new foods and require she eat so many bites of green beans before she leaves the table, but she can get to be pretty normal. Keep offering the food that isn’t liked. Brinley didn’t like vegetables. I still gave her 1 tablespoon of vegetable at lunch and 1 tablespoon of vegetable at dinner. I slowly worked that up over time as she grew to like it more. Mix foods she likes with foods she doesn’t. Find flavors that work well together. I mixed her green beans and peas with pears and peaches. This helped mask the flavor of those while still giving some of the flavor so she could get used to it. I don’t have to mix it anymore. You can also mix in oatmeal to help weaken a flavor. Don’t give up on a food! I am serious when I say keep offering it. For older children, go ahead and season and flavor food. I figure a child eating carrots with ranch dip is better than a child not eating carrots at all. Go ahead and put butter and spices on things if needed (and again, if the child is old enough for such things). Make sure your child is hungry enough for a meal. If your child has a snack close to a meal, she won’t be hungry enough to eat something she might not prefer. If my kids are hungry close to a meal and really need to eat, I have them eat fruits or vegetables so I don’t feel bad if they aren’t as hungry by a meal. Make it fun. It doesn’t need to be “strictly business.” You can do airplanes and trains. You can turn it into a game of imagination. Arrange the food into something fun, like a smiley face or doing something like ants on a log. A fun video is found here: http://pbskids.org/daniel/videos/#. It is Daniel Tiger and is the clip of Trying Veggie Spaghetti. This video has made McKenna even more adventurous than she already was. In the end, the main things to remember are don’t stress and to keep offering the food over time. As even just the site becomes more familiar, your child will be more willing to eat it. Thank you so much for this post! I think I have a semi-picky eater on my hands. I say semi because he will eat all his fruits and veggies in purred form but when I try and give him pieces of cooked fruits or veggies he wont touch them. He is almost a year and does well with other finger foods (cheese, pita and hummus ext. )but he prefers to feed himself now so I am at a loss. I think it is a texture issue but don't know how to fix it. Any suggestions? My 18 month old daughter has NEVER liked drinking anything except water. I exclusively breastfed her and although I tried several times with both formula and breastmilk she would never drink from a bottle. She never liked and refused to drink milk and will only drink water to this day. Any ideas on how I can get her to drink milk or something else that will fulfill that caloric/nutrient need? Thanks! Thanks for this post! Great tips. We are just getting to the point where my (almost) 8-month-old daughter is showing preferences. I wouldn't say she's "picky" necessarily, but she used to eat anything I put on the spoon, and now she won't.I've definitely found that mixing with rice or oatmeal can help when a food flavor is kind of strong. My daughter would eat about anything until about 14 months when I started to introduce crunchy foods like cucumber or broccoli in their whole form. I kept offering them, and she's always been good about trying what is on her plate, and now at 18 months we're making great progress! My oldest, now 6 will eat anything and try anything except grilled cheese… Weird, I know! My second who is now 2 ate everything until about 1 1/2 and then became picky. I raised them and fed them the same except he was exposed to "junk" earlier because of the older one and I think it made him picky. Is this possible? He is healthy and a fine weight but it is frustrating. I will never make food an issue and I figure if he's hungry enough he'll eventually eat. I've also tried making it fun, we all cheer, big brother modeling eating the foods, totally ignoring, dipping sauces, etc. Any other ideas? Thanks for your comments here! The Teacher,I think it is possible to be pickier because of exposure to "junk" food at an earlier age. I know that I am super careful about when my kids get their first bite of something with sugar. I think most people assumed I would relax more on that after several kids, but Brinley still hasn't had anything sweet (a friend tried to feed her a powdered donught at 6 months old…I saved her 😉 ). But I also think people all have different taste buds and preferences. For example, my husband prefers salty snacks and I prefer sweet snacks. McKenna isn't that into carbs and Kaitlyn would live off of carbs alone if I allowed her. I would just keep giving him a small serving of the healthy food at each meal. Don't make it a big serving; that gets overwhelming. I require a certain number of bites of a food even if it isn't a favorite. So Kaitlyn doesn't love green beans, but she still has to eat 3-5 beans each time we have them. She then will have a veggie she likes. I just want to keep exposing her to them (as well as get a bit of the vitamins from a variety of produce) because some day, she will grow to like them. You might only require one bite.Also, in encouraging my children to try new foods, if they try one bite and don't like it, I let it stop at that. I don't want them to be afraid of trying something new. There are also times I will make the same meal but have some more child friendly. So if I am making enchiladas, I will make a pan without sauce and a pan with sauce, then they can decide what they prefer. I remember when I was a kid, there were some flavor profiles I didn't like. I am fine with them eating a simplified version of a food. We just keep trying at least one bite each time it comes up.